Pork neck bones and rice is classic Southern comfort food. OK, I know a lot of you are going to have the same reaction to this that Husband did. Pork neck bones are very common here in the South. If you’re in other regions you might have a hard time finding them. You can ask your butcher or even just use button ribs or rip tips. Me: Neck bones and rice. Husband: Oh, OK. It smells goo… Wait. What? Me: Because they had the most beautiful packs of them at the grocery store this morning and I just had to have them! Me: Because I grew up eating this and it’s delicious. And because I want to. Me: Get your behind out of my kitchen. Husband: I just don’t understand why anyone would cook a pot of bones. On purpose. Me: Because these bones make the most amazing stock which makes the most amazing rice and as a bonus you get to nibble on all the bones. It’s like eating rib tips. Husband: I’m not eating neck bones. Me: Good. More for me. And I wouldn't advise eating the bones anyway. Wouldn't want you to choke. Once again I find myself laughing at what a mismatch Husband and I are. Bless his heart. Bless his Canadian, center cut with lots of ketchup, heart. Growing up, we usually had this as a side dish to some other pork because there’s really not a ton of meat on the bones. But Lord Jesus, they make a good stock for rice. And y’all know I love me some rice. Sometimes Mama would throw a pack of country ribs in the stock too to supplement the amount of meat – in those cases, we would have it as a main dish. And when I eat this, I have to have black-eyed peas (or crowder peas or field peas) and fresh sliced tomatoes. And throw some collard greens on the plate too? Man, dang! My mouth’s watering just thinking about it! 1 1/2 cups uncooked white rice. Heat a Dutch oven or large pot over medium-high heat. 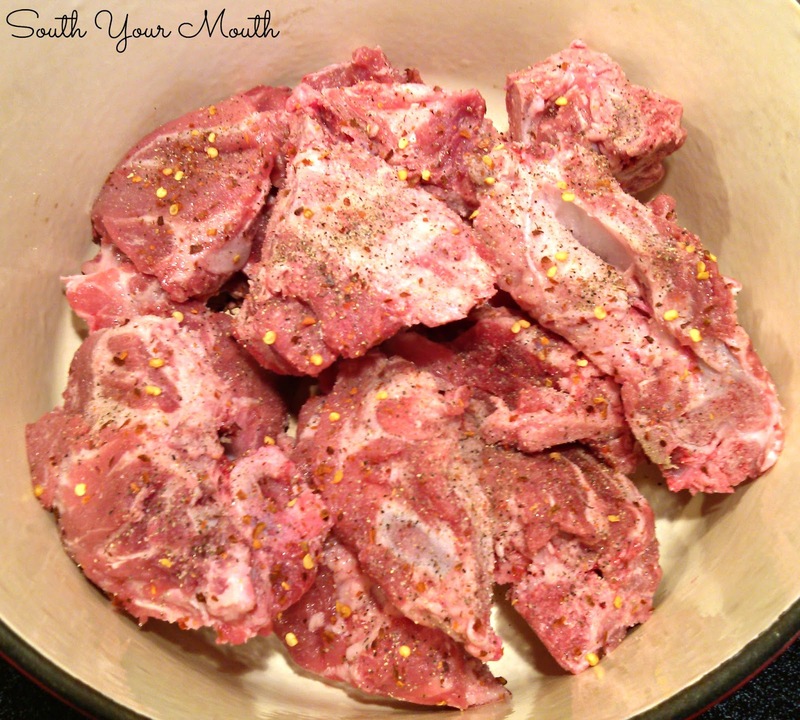 Season neck bones with 1 teaspoon salt, black pepper and red pepper flakes then add them to the hot pot. Let the neck bones sear a few minutes then add water. It's OK if the water doesn't cover all the neck bones - they will cook down. Reduce heat to low, cover and slowly simmer for 2-3 hours. Bring stock to a boil then add rice and remaining teaspoon of salt. Stir to ensure rice isn't sticking to the bottom, reduce heat to low, cover and cook for 25 minutes, stirring once halfway through cook time. Turn off heat, leaving pot on burner, and let rest, covered for 45 minutes before serving. I usually douse mine with a few shots of hot sauce before eating. Oh my goodness...finally! Someone who understands the goodness of neckbones! When I was a kid I thought it was treat when my Dad cooked up a pot of either beef or pork neckbones. I loved them just as much the next day with ketchup after school. I thought everyone knew that the meat right next to the bone is always the best tasting! It's my lucky day. I just saw some in the grocery store the other day. I hadn't had neckbones in over 5 years. They are sooooo delicious. Thanks for being them back and they will be in my belly this weekend! Cheers!!! I am seriously drooling right now just tasting this in my mind!!!!! !Our store carries the bones and I WILL be cooking a batch this week.YUM!Thanks for sharing.I am a BIG fan of rice also. We ordered a hog last fall from a local farmer. Just had it butchered and picked up all the pork when we got home from SC. WHY were we not offered the neck bones? Although, I probably would have said no at the time of ordering the cuts, since you hadn't introduced me to this recipe yet! Oh yeah, and collard greens? Finally had some of those, and loved 'em! Yummmm!! Love me some neck bones! My hubby has a Yankee heart, so we have some of those same discussions...lol. Thanks for a great recipe! Put some neckbones in your next pot of tomato sauce. That whole meal sounds so good. Mama used to fix neck bones and noodles that were delicious. Pinned this for future! Thanks for sharing! I served neck bones and rice when my daughter was a teenager. Later years after her friend was married, the friend called to ask for the recipe. Good stuff! Neck bones in with a pot of pintos is out of this world! Northern girl here of Slovakian descent. Neck bones with sauer kraut and boiled, buttered potatoes. MMMM. Tasty! Love your blog. Neck bones make THE best spaghetti sauce on the planet too! I am so happily full right now! Happy sigh...it has been way too long! 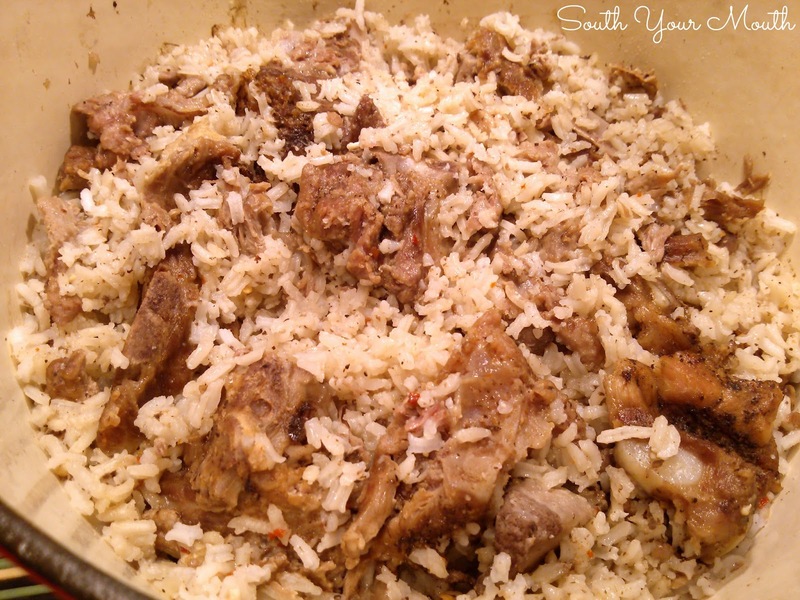 Neckbones and rice was one of my Mother's favorite things to eat. She has walk on now for few years. One day I was at at the store and overheared a small girl say, "Are we having neckbones and rice? That is my favorite." My Mother came to my mind and had a smile. One of my sister in laws used to make this meal. My sister and I were discussing it last week. Rainy dreary day and I decided to get the bones and make dinner for myself. Hi Mandy.. I just found your website and I'm from Charleston... so your way of cooking is right up my alley! I've already fixed your Ham Salad... my husband wouldn't let me share the dish! LOL. Tonight your shake and bake concoction for chicken... Thank you so much! I have a question are these pork neckbones fresh or smoked? They're fresh. I've never seen smoked ones but I'd sure love to find some! I am so glad I found your website and this recipe. My husband grew up on neck bones and I have cooked a few time when my children were young. My daughter told everyone at school that neck bones were her favorite food. I will sure try this recipe. Sure, you can cook these down in a crock pot. Do i use the same amount of water if cooking in the crock pot? Also will 3 hours on low be fine in the crockpot? get all that extra stuff (sorry) off and then recook and add broth and seasonings..
Yesss! Boiling all that gook off is a must! My family from Alabama cook them in much vinegar, onions, salt n' pepper, thats it and that's all. My mom (Ohio) used to add barbecue sauce. Both are good, but I prefer them Bama style. Nicole, do you use vinegar instead of water? I'm from Wisconsin, but I grew up eating neckbones! As a kid neckbones and black-eyed peas was my favorite meal, not pizza or hot dogs. Glad to see someone else appreciates them as much as I do! Hmm... neck bones, rice and black-eyed peas. You just gave me an idea! Thanks. The only difference I see in your recipe is that I always add about 1/2 of a large onion, diced. Look forward to going thur more of your site. Thanks for posting. Neck bones and rice, is sure a southern thang. They season veggies very good. baked sweet potato...oh yes. YES. This meal was awesome. I kind-of wanted to eat the whole pot. Okay, I REALLY wanted to eat the whole pot. But I stopped at just half the pot. :) This recipe is so much more than the sum of it's parts, I just can't get over how flavorful this was. Neck bones are so cheap too, it cost just a couple bucks for a potful of deliciousness! Thanks so much for the recipe! This so reminds me of my mom...I'm cooking this today. Neckbones and blackeyed peas, greens and cornbread. Moms was straight out of Louisiana. Thanks for all the memories! This so reminds me of my mom as well . I Lost my mother 2 years ago and this is one of her favorite meals to cook and mine as well . I even still use her same pot to cook them in. I'm actually cooking some for dinner tonight for my family. I will always cook this meal in memory of my mother .!!!! Here I am commenting again....cooking your neck bones and rice...Never cooked that before but my daughter has cooked a lot....just started it. I am sure it will be good!send me a signed cookbook.....ha ha! Neckbones, cooked with chopped onions and a couple of cloves of garlic. I also add red potatoes and here lately carrots, bay leaves and a pork flavor packet. Need I say scrumptious. It could very well be a soup. Mmmmm!!! Can you use minute rice? No rice. Southerners do neckbones and cabbage. Ha! that's on my menu for today. Neckbones, cabbage, and fried corn. Every New Year's Day is a blessing because being from MS coast & now living in Louisiana, my mama makes pork neck bones, rice, black eyed peas, cabbage & cornbread!! It's the best meal of the year! I'm trying my hand at making them now myself & I can't wait to engineer a recipe to share with her as a thank you. When you were describing your must haves my mouth was watering too, I love collard greens (it's the only one) with those pork necks & cornbread, I might push the little ones out of the way to get to the serving table. LOL!! not really, but when my mama makes cornbread it's on. she adds a little of the pork grease to the batter & greases the iron skillet with it so you know that stuff has a good crunchy bottom & so delicious. I'm going to try your recipe for my first time cooking them, it's cool I use Tony Chachere's instead of the red pepper flakes, right? I hope so. Thanks so much for this recipe, I really want to surprise her with these. Happy New Year!!! Can I use pork neck to cook my veggie soup? OMG I am from the north but did all my rearings in the south and as a single parent my kids grew up on them...when money was tight neck bones would stretch my budget. This is exactly how my beautiful Mom use to cook hers & now I'm cooking a pot of them for my family. She always made spinach & fresh sliced homegrown tomatoes with them & the tradition has now trickled down to me! What a wonderful meal!! !